So you wanna build a game and need some free assets to work with. It may seem like there’s not much out there but you have to look in just the right places. Many times artists design their own concept art for games, or developers will build a game engine but not have any artwork to use. It gets even trickier when you’re designing graphics in 3D programs or using pixel art. But you can also find tons of free assets online that’ll save you time. And these are my favorite sites to find free assets, many of which go beyond simple game art to help you create an entire virtual world all your own. The first and largest site you should check out is OpenGameArt. It was built as a free repository for free video game assets to help game designers build any kind of game they want. Best of all the site was designed solely for Creative Commons art so you know everything on here is free to use. Many assets fall under a public domain license so you can use the artwork for personal or commercial works without credit. Have a look at the FAQ page to learn a bit more. This site is absolutely massive and it’s got a ton of categories to browse through. You can find 2D art and 3D art along with tons of smaller categories for sound FX and background music. This site even has a place for concept art, all free and released for anyone to use. I’ll be the first to say that this website’s design is not super pretty… but you don’t go here for the design. You go here for the free stuff. And in my eyes OpenGameArt is the best place to start if you need free assets for indie game development. 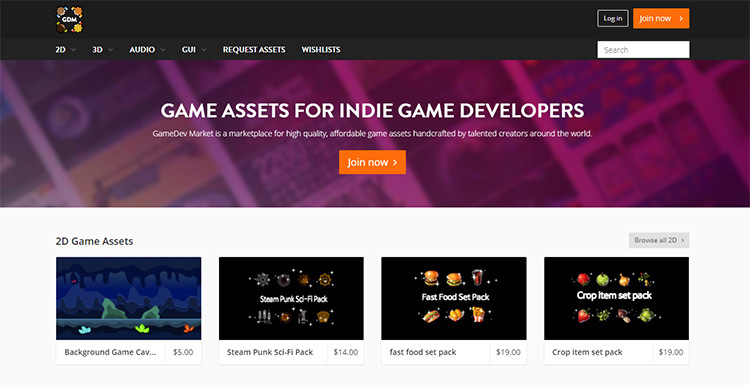 The digital marketplace Itch.io offers a mix free and premium game assets. These work a little differently than OpenGameArt because you’re not downloading assets under same licenses. Not to mention a good portion of the marketplace is full of premium assets that you’d have to buy before using. 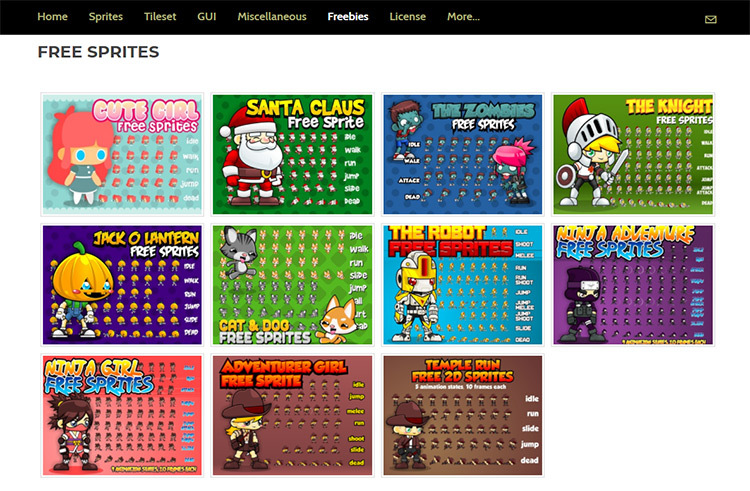 Thankfully Itch.io has tons of free stuff too and you can find all of it under the free game assets category. Make sure when you’re searching that you filter the results based on what you need. Each asset looks a little different from 8-bit to 16-bit graphics or 3D renders for more complex games. The Itch community even sells a lot of completed games too. Some of those are totally free if you wanna play around with other people’s work. But if you’re an artist or game designer then you’ll really love the massive game asset collections. Granted you can find a lot more variety in the paid resources… but you can also save a lot of dough sticking to the free ones. 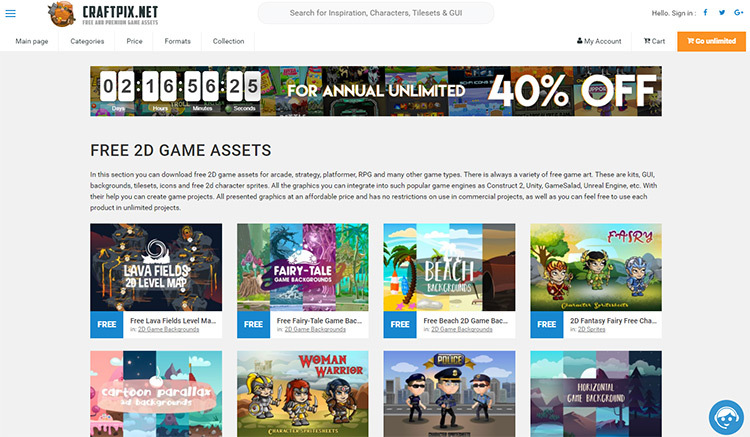 Here’s another online marketplace for gaming assets with a combo of free + premium choices. GameDev Market works much like the Itch.io community where artists can sell their game artwork online for a fixed fee. But many artists release their stuff totally free just to hook in potential customers. To browse the free content look through the main menu and browse to whichever asset category you need. For example, if you hover “2D” in the menu and click “characters” you can browse all 2D character art. Then in the sidebar select “free” from the dropdown list. Now you can browse free character assets with easy download links for each pack. The asset pages even tell you exactly what’s inside the zip file along with the software used to make everything. GameDev Market is a fantastic site for indie gamers and indie concept artists too. If you learn how the marketplace works you can earn some decent side income by creating killer assets and selling them to the community. Reddit has a community for basically everything. Naturally there are many subreddits on art but there’s one that stands out for just game art. 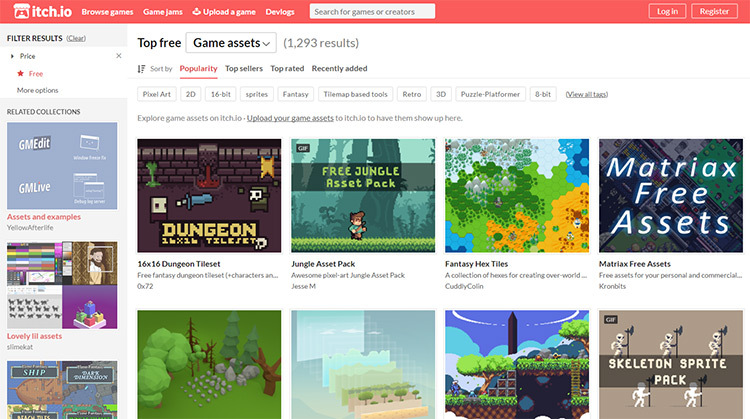 The /r/GameAssets community curates tons of free game assets from all over the web. It’s almost like a fan-curated list of the best game assets that anyone can access. Submissions are primarily links to other sites that include free downloads for sprites, music, backgrounds, menu GUIs, you name it. Compared to many other communities this one is pretty small with only 9,500 subscribers. And it’s not super active either with just a couple posts every week or so. But the mods are strict about submissions so this community is mostly spam-free and packed with tons of varying game assets. The biggest problem is the slow userbase. Since this moves at such a snail’s pace it probably won’t be something you visit every day. But it is worth bookmarking to just search through the archives and see what you can find. 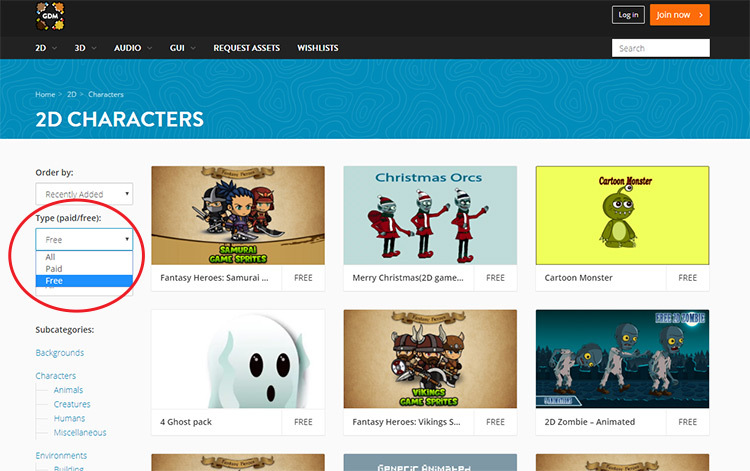 On the Game Art 2D website you’ll find a huge gallery of royalty-free game assets. These come in many styles from sprites to tilesets and even some basic concept art. Most of these assets come with a price tag but the site does have a freebies category. And in that category you’ll find some really great stuff. Now I should mention this library is smaller than other marketplaces. That means their collection of freebies is even smaller. Still this site is worth checking out just to see what you can find. It won’t become a staple that you visit all the time but it’s a trustworthy library with some great assets to work with. Last but certainly not least is CraftPix. This seems like a newer game asset site compared to some of the others in this list but CraftPix does have a sizable library. You can find some really crazy stuff here like casino GUIs for mobile games and custom 2D backgrounds for side-scrollers. The majority of premium content ranges from $2-$10 but you can find lots of freebies as well. As of this writing I’m counting about 60+ free assets from backgrounds to characters and various GUI elements. That’s much smaller than other sites like GameDev Market, but it’s also got some unique stuff that you won’t find elsewhere. Again this is worth a bookmark just because it’s one more place to visit. I can’t say how fast it’ll grow or how much you’ll find here, but I do think CraftPix will be around for the long haul. The majority of these game asset sites are built up by the creators above anything else. That means the artists really control how many free assets are available. So if you’re an artist or digital designer consider releasing some of your stuff onto these sites. You can build recognition for your work and promote premium assets along with freebies to earn a little money on the side. Either way the demand for indie game assets is growing every year. Whether you’re on the supply side or the demand side, this is one part of the entertainment art industry that’s bound to take off.